The Phillips University Legacy Foundation is pleased to announce it is accepting new applications for its Undergraduate Scholarship and Leadership Development Program for the 2017-2018 academic year. 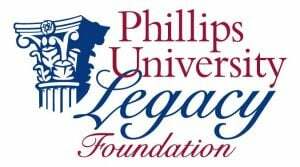 The Legacy Foundation’s Undergraduate Scholarship and Leadership Development Program makes annual awards of up to $5,000 per year to full-time undergraduate students pursuing a liberal arts education at any of the 17 colleges or universities currently or historically affiliated with the Christian Church (Disciples of Christ). Recipients are chosen based on their academic achievements, their present and potential leadership in the church, their chosen vocation, and their community. It is not a requirement that recipients attend a church that is affiliated with the Christian Church (Disciples of Christ). The program is available to incoming freshmen as well as college sophomores, juniors and seniors. Completed application forms are due March 10, 2017 and award notifications will be sent out April 10th.